At the end of Soulpepper’s world premier of The Dybbuk, or Between Two Worlds, the audience leapt to its feet, giving the entire cast a standing ovation; I was not one such enthusiastic applauder, finding myself restless with this particular production of S. Ansky’s classic. 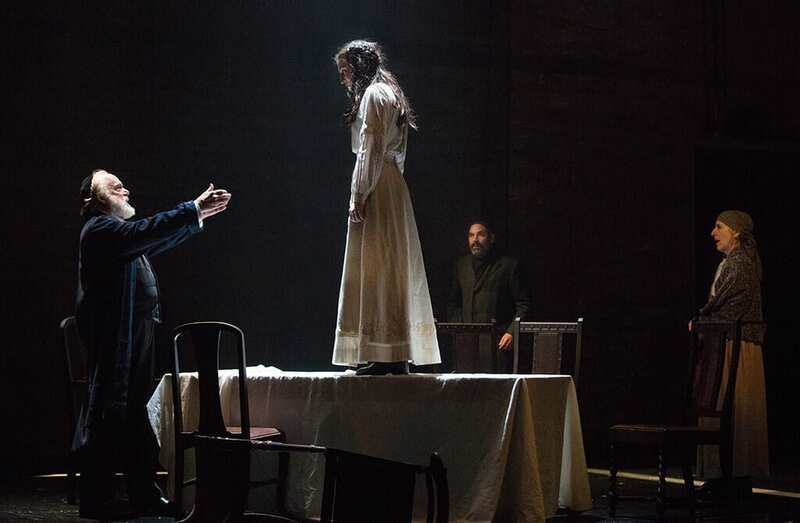 The Dybbuk tells the tragic, but ultimately triumphant story of young lovers bound together by fate, but separated by ignorance and the strictures of convention. 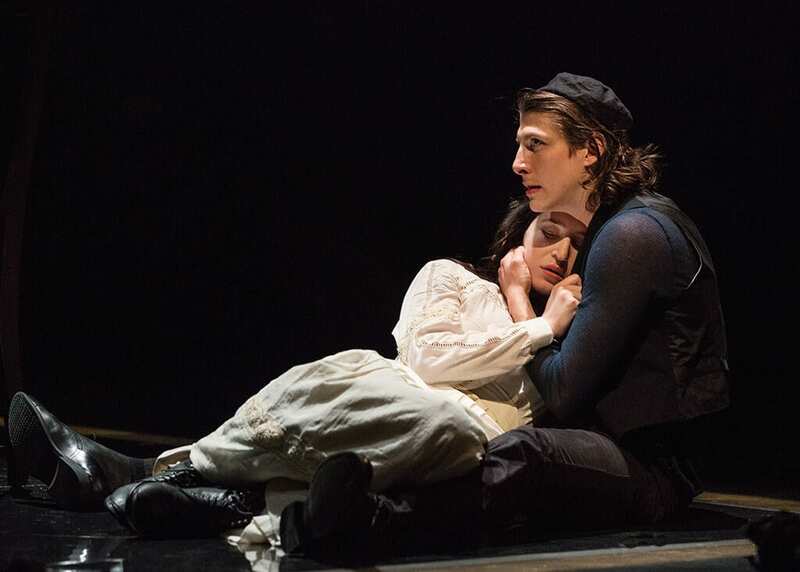 But, as in the case of Romeo and Juliet, the device of the young lovers provides an opportunity to explore and reveal other, more profound issues; issues of power, of culture and tradition, and most importantly, of modernity. In The Dybbuk, a young hasidic scholar, Channan, is deeply in love with Leah, the beautiful daughter of the rich and powerful Sender. For Channan, Leah is no ordinary woman, but the immortal beloved, the human vessel of God’s divinity, and in aspiring to her love, his soul aspires to divine fulfilment. When Leah is promised in marriage to another man, Channan chooses a horrific death, falling victim to his own passion, and damning his own soul. His soul possesses Leah as a dybbuk, and the entire community of Brinnitz must negotiate her release. But Leah will be not be bound by tradition and convention, and when Channan’s spirit is exorcised from her body, she steps past the boundaries of her known world, to reunite with her true love. It is certainly possible to see this play as an ethnographic microcosm of an early twentieth century shtetl, but to do so would be to miss the subtexts of proto-feminism, the ravaging effects of early twentieth century anti-semitism, and more importantly, to cast the play’s profound explorations of the individual and collective within a somewhat tokenistic representation of a culture petrified in time. The production choices made tonight were largely conventional; the set and costumes were minimalist and authentic, and the effects of magic produced by timeless old theatrical sleight of hand. To be sure, when Soulpepper plays to convention, it does so remarkably well. The absence of digital gimmickry and the absolutely masterful ensemble required to pull off some of the effects shows us this company doing what it does best. And yet, it was also this desire to appear authentic that somewhat diminished tonight’s performance, because it led to uncomfortable moments where one almost felt a lapse into stereotype. Take, for example, the characterization of Sender as a money-grubbing, bumbling Jew. While it certainly possible to play him this way for comic relief, to do so entirely misses the tragedy of his ignorance. Likewise, as the men of the synagogue gather to tell their stories of great Rabbis, it is easy to see these tales as superstitious myth unless we see also see that these tales are all they have against the gathering tide of anti-semitism that is poised to destroy them. The text provides this complexity, but sadly, many of tonight’s performances did not. What was most remarkable about this production was Anton Piatigorsky’s splendid textual adaptation. In the hands of Piatigorsky, Ansky’s work becomes so much more than a cultural artifact. Suddenly, lines suggest profound intricacies and heart-breaking individual and collective ironies, voices speak of histories of persecution and disenfranchisement, and, like any truly great play, we enter and are transformed by the profound struggle of the human condition. The text of this play seems to remind us that this is not just a story about life in a shtetl in the early twentieth century, and if allowed to speak in its own voice, I think that Piatigorsky’s adaptation of this play could be remarkably contemporary. Indeed, there were moments when on hearing a line, I dearly wished that the actor had thought to bring more to its utterance. In a story of young love, tonight’s performances by Colin Palangio as Channan and Hailey Gillis as Leah were truly exceptional. Palangio was a veritable force of madness and sublime passion lighting the stage with the sheer energy of his performance. Gillis perfectly outlined the arc of Leah’s growth from a fragile girl to the young woman who could forsake all in the name of her true love. Throughout her performance, one sensed the growing tide of inner power that emancipates her from the patriarchal bonds of her father and her community. Diego Matamoros, as the enigmatic messenger, was that mercurial traveler from the past and the future. He is the amoral Luciferian voice of modernity, come to herald change, and to tell the wise ones that they are fated to fail. As the world-weary Rabbi Azriel, William Webster brought a patrician grace that slowly dissolved as his character reached the limits of his power. Here was a powerful Rabbi wielding the cosmic power that damns a soul to anathema; there was a defeated old man faced with the great riddle of modernity, of a world fragmented in a million places from which God’s finger would reach to bring chaos upon us all. This is surely not a performance to be missed, and one hopes that as it grows with the company, it will emerge in new and wonderful ways to ask the same great questions, and to remind us of our lost histories. Aparna Halpé is Professor of English at Centennial College, Toronto, Canada. Aparna holds a doctorate in English Literature from the University of Toronto, and has a life long love of the performing arts fostered by her early training in music, dance and theater. In addition to her scholarly work, Aparna is a published poet and founding member of the tango ensemble Ruta 7.